Gold for June delivery rose $1.90, or 0.2%, to settle at $1,295.20 an ounce on the Comex division of the New York Mercantile Exchange. "The dollar strength really hurt precious metals and we’re seeing some of that reverse with most currencies running a little higher versus the dollar," Reuters quoted Chris Gaffney, president of world markets at TIAA Bank. "We’ve got tame inflation, the trade situation is getting resolved and Brexit looks like it’s going to be pushed down the road. So right now investors don’t have any incentive to buy gold," Gaffney added. 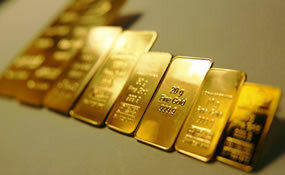 Gold futures edged 40 cents lower this week, or less than 0.1%. They shed 0.2% last week and lost 1.1% in the week before then. On Thursday, the yellow metal settled at its lowest price since March 11. Gold is 1.1% higher on the year to date. "Sixteen market professionals took part in the Wall Street survey. The bullish and bearish camps each attracted six votes, or 38%. Another four voters, or 25%, called for prices to be sideways or were neutral. Meanwhile, 568 respondents took part in an online Main Street poll. A total of 299 voters, or 53%, called for gold to rise. Another 170, or 30%, predicted gold would fall. The remaining 99 voters, or 17%, saw a sideways market." Elsewhere, silver for May delivery added 9.6 cents, or 0.7%, to end at $14.963 an ounce. Silver futures traded 0.8% lower this week after losses of 0.2% last week and 1.9% in the week before then. The precious metal is 3.7% lower on the year so far. July platinum settled up $3.20, or 0.4%, to $898.50 an ounce, but logged a 0.8% weekly decline. Palladium for June delivery tacked on $17.60, or 1.3%, to $1,350.20 an ounce, for a 0.3% weekly increase. The pair of metals is higher on the year with advances of 12.2% for platinum and 12.8% for palladium. Gold declined $4.50, or 0.4%, to $1,294.30 an ounce. Silver fell 9.5 cents, or 0.6%, to $15.065 an ounce. Platinum added $1, or 0.1%, to $899 an ounce. Palladium declined $14, or 1%, to $1,365 an ounce. In LBMA results for the week, gold rose 0.5% and palladium gained 1% while silver shed 0.9% and platinum lost 0.4%. Gold bullion coins moved up by 2,000 ounces after rising by 6,000 ounces last week. Splits included 1,500 ounces in American Gold Eagles against 3,000 ounces previously and 500 ounces in American Gold Buffalos compared to 3,000 ounces previously. American Silver Eagle sales were muted this week after rising by 550,000 ounces last week. American Platinum Eagles rose by 500 ounces after climbing by 1,100 ounces last week.